It could be the prank calls, the people calling in trying to order a pizza when you’re an insurance company, or just the irate customers with… colorful language. There’s also just the matter of handling a constant influx of phone calls, and making sure that you can get to them in a timely manner, without customers deciding they’ll take their business elsewhere. To put it very lightly, when you run a call center there are all types of daily nuisances that can get in the way of a good day’s work—and that’s before you even start juggling your time sheets, vacation days, and voicemail accounts. Luckily though, call center software can help your company manage large numbers of calls from various departments within an office, or from multiple branches across the world. Not only that, but call center software also typically includes features like live chat, social media integration, and SMS. Call center software can lower costs and make your business more flexible and productive. Here’s a roundup of the best this industry has to offer. When looking for call center software there are some must-haves that should be at the top of your list, such as controlled calls, multiple phone connections, voicemail, and call routing extensions, to name a few. Life is short, don’t spend it trying to figure out your call center software. Setup should be all but instant, allowing you to get up and running within minutes, on a system that even a novice can navigate like a pro. Call it line hunting or a hunt group, rest assured, you won’t need a firearm or comfortable shoes for a call hunt. Call hunting routes incoming phone calls into a group of people that are set up to take incoming calls, what is typically known as a “hunt group.” Usually these can include dozens of people, arranged into a queue where each subsequent incoming call is routed to the next recipient in line. This can be crucial in a call center where you have a high value of phone calls and you want to make sure calls are answered without customers needing to know multiple extension numbers, and without representatives waiting around while the calls pile up. When a customer calls, an automated system answers the call and then queues it, often in terms of which department the caller selected. Instead of all of the phone calls being tossed into a giant vat of waiting phone calls, the calls are organized and routed to the call groups where they will be answered in the most timely manner. You know a VoIP system can save you money and get your telecommunications running better than ever, but at times you can have some patchy voice quality. Why’s that? There are a few explanations. A poor internet connection is a common problem, so make sure that your provider gives you business class high speed on your connection and that you have a reliable VoIP router. What’s known as “latency” refers to the amount of time between when a sound exits your mouth until the person on the other side hears it. When it’s bad, that’s when you have that echo or delay on the line. This can occur when there is too much information heading through the system (in the form of voice packets) and becomes backed up. Look for a software provider that can prioritize VoIP traffic and handle a large volume of calls. You also want to make sure that the system has an “uptime guarantee” of over 99%, so you can be confident that you’ll stay online. When it comes to quality, Vonage has earned a stellar reputation in the industry. Sophisticated analytics reporting allows managers to get a comprehensive view of their telecommunications, from call volume to duration, wait time, and more. When you’re training new operators, having data on hand can give you a wealth of teachable information that can help your employees grow. You can see how long their average successful sales call took, and how often they were hung up on in the first few moments of the call. You can see which calls, using which scripts, were the most successful, including factors such as time of day, and so on. Analytics can help with customer management, by showing you which customers came back and what they bought—while also telling you what they have in common, and by inference, what type of customers you should target in the future. You can also track how long your average hold times are, and work on ways to improve your customer experience. In addition, you can track employee efficiency, including how many calls are handled per shift, and who is making the most of their time on the clock. You can’t please all the people all the time, and you for sure can’t answer every call right away when things get busy. That’s why automatic call divert (ACD) is one of the most important features for most businesses. If your phone line is busy when a call comes in, this feature will automatically forward the call down the line to another available representative. This is a cost-efficient, fast, and dynamic way of maintaining order, consistency, and call flow. You can also get call center software that allows you to customize your call priority management, in order to ensure that high priority calls get to where they’re going faster, and don’t get lost in the mix. Vonage also offers a useful feature known as Follow Me, which redirects calls to a specific agent from one location to the next until the agent is found (for example, at the agent’s desk, cell phone, or house phone, respectively). If you’ve ever sat snickering while you watched a spouse or loved one struggle with a computerized voice recognition operator, then you know that not everybody loves this feature. And while it’s true that voice recognition operators can be a mixed bag, when done right it’s a real time saver, and as this technology improves, it stands to get only more user-friendly. By removing the need for a live, human operator, IVR allows callers to navigate the system and get things done faster than ever before, with a fraction of the manpower on your end. If your company makes a large amount of national and/or international calls (say, if you’re a call center) then this feature can save you a large amount of money on your phone bills. Companies like Vonage and Ooma offer unlimited national calls, which is ideal for small businesses with a local clientele. Conversely, MegaPath and Jive each offer unlimited international calling for enterprise customers. When training new employees, it is helpful to be able to subtly—or not so subtly—coach or in some cases intervene when calls get too difficult for them to handle. There are a number of features that can help you out with new hires, such as call barging, which allows you to drop in on live calls to speak to both parties, allowing you to step in and help out at any time during a business call. Another feature you can look for is whisper coaching, which allows you to speak to an employee during a phone call without the customer being able to hear it. Call monitoring allows you to listen in on calls, while call recording can be put to good use by supervisors and new hires who want to review calls with customers to find room for improvement. This feature allows your agents to take notes on how the call went, record which follow-up actions are required, and detail the outcome of the call. Labels include simple one-word summaries such as “busy” and “disconnected” as well as labels such as “transferred to marketing” or “refund granted,” which can provide a much clearer picture of where to look and an overview of what’s going on at a glance. Voice messages have come a long way since the humble answering machine. Today you can find various voicemail options that are tailor-made for people who don’t have the time to play back their voicemails one by one. Many call center software providers feature options that allow voice-to-text transcription of voicemails, which are then sent to you by email in text or audio. Others allow you to manage your voicemail inbox online, so you can view, manage, download, or delete your messages directly from your desktop. You can also forward voicemails to other extensions and, with the text-to-voice option, you can listen to your voicemails hands free—no small thing if you’re behind the wheel. Some brands will offer a trial version so you can see how the system works, how easy it is to learn and customize to your needs, and how responsive customer support is. Additionally, companies like RingCentral will let you sign up without a contract. This means that you can test drive the system and then sign up with no strings attached (some restrictions may apply). RingCentral also offers free setup, and a money-back guarantee, making it a cost-efficient option. Ultimately though, whether or not the price works for you depends on your company’s unique telecommunications needs. 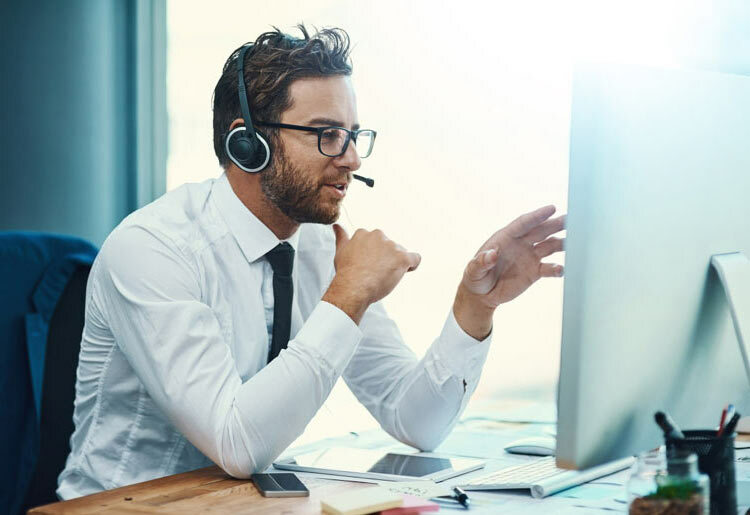 For more information, check out this list of the top call center software of 2019.